I was watching some early silent short films the other day, and I began to wonder what films I would show if I were to teach a class on the history of film. Where would I begin? What trends would I want to highlight? How could I possibly give a good overview in one semester? I'll admit much of the structure would be inspired by my own World Cinema professor, who did a fantastic job over the course of two semesters laying out a comprehensive overview of the history of film. But for my purposes here, I'm condensing it down to one semester only. 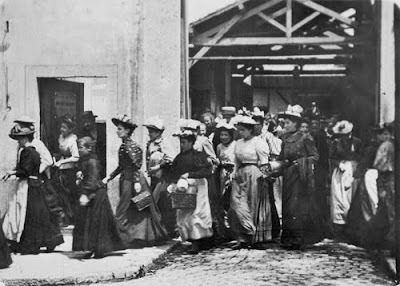 WORKERS LEAVING THE LUMIÈRE FACTORY (Louis Lumière, 1895). I would start, of course, with the Lumière brothers' Workers Leaving the Lumière Factory (1895), the first commercially exhibited film ever made. I would probably show a few more early shorts - Georges Méliès' A Trip to the Moon (1902) is a must, as well as the Lumières' The Sprinkler Sprinkled (1896), perhaps the earliest attempt at using film to tell a story. I would also show a few "actualities" such as San Francisco: Aftermath of an Earthquake (1906), to give an idea of what early audiences expected from films. One last early narrative short, Edwin Porter's The Great Train Robbery (1903) would pave the way for D.W. Griffith's epic masterpiece, The Birth of a Nation (1915). Without Griffith and especially without Birth of a Nation, there would be no modern cinema as we know it. He pioneered many of the cinematographic and editing techniques that are still used today, basically writing the book on how stories are told through film. The problem, of course, is that the content of the film is reprehensibly racist, portraying the Ku Klux Klan as heroic and African Americans savage and animalistic. 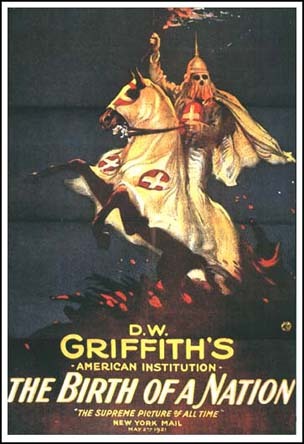 I could easily cop out and show Griffith's more socially acceptable follow-up, Intolerance (1916), which helped pioneer the overlapping/interconnected storyline technique a la Crash, but Birth of a Nation is the real groundbreaker and cannot be ignored, despite its problematic and offensive content. 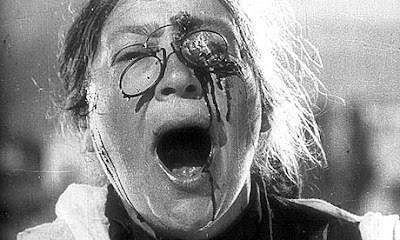 A shot from the famous Odessa steps sequence in BATTLESHIP POTEMKIN (Eisenstein, 1925). After a discussion of the editing techniques in Birth of a Nation, I'd move right along to Sergei Eisenstein's Battleship Potemkin (1925) and his Soviet Montage theories, as we discuss the importance of editing in effective cinematic storytelling. There would also have to be a brief introduction into surrealism and Dada, with Luis Buñuel's Un Chien Andalou (1929) and Man Ray's Le Retour à la raison (1923) serving as a fitting overview. 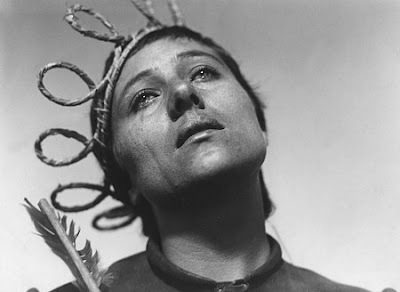 Maria Falconetti in THE PASSION OF JOAN OF ARC (Dreyer, 1928). I would round out the silent era with two of its supreme masterpieces, showcasing the medium at the height of its form - Ménilmontant (Dimitri Kirsanoff, 1926), and The Passion of Joan of Arc (Carl Th. Dreyer, 1928). Ménilmontant is a perfect example of how to tell a story without words. It is a completely visual film, with no dialogue or intertitles to guide the audience, and Joan of Arc is, in my opinion, the greatest film ever made - a brilliant work utilizing mostly close-ups and the power of Maria Falconetti's legendary performance to create as close to a spiritual experience as the movies have ever come. 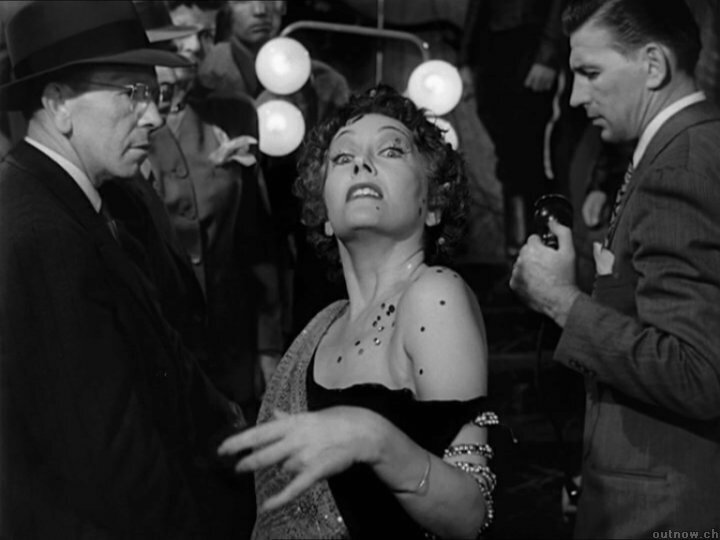 Norma Desmond's immortal assertion in Sunset Boulevard (Wilder, 1950), that "we didn't need dialogue, we had faces" never rang so true as it does in Dreyer's immortal masterpiece. There are many movements within the silent era, such as German Expressionism, that would probably have to be skipped due to time constraints (I could do an entire class just on the silent era), so it's time to move on (sharp eyed viewers will spot influences of German Expressionism in Joan of Arc's art direction). As much as it pains me to do so, I would probably have to at least show a clip of The Jazz Singer (Alan Crosland, 1927) to introduce students to the sound era, but I would transition into talkies as quickly as possible, perhaps with a few early sound films like Fritz Lang's M (1931), which not not only features a fantastic performance by Peter Lorre, but is an excellent showcase for how sound was often used in those early days, especially by a master of silent film like Lang. It's also one of the all time great thrillers, and is a textbook on creating and maintaining suspense. To put the era in a historical perspective, I would then show Footlight Parade (Lloyd Bacon, 1933). The Busby Berkeley musicals are a perfect example of what audiences of the time wanted to see to escape from the realities of the Great Depression, and the carefree exuberance and breathtaking precision of Berkeley's glorious dance numbers set the tone for an entire era of film. 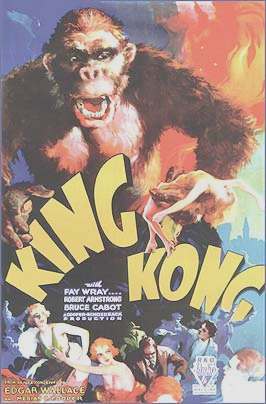 Special effects also grew by leaps and bounds thanks to films like King Kong (Merian C. Cooper, Ernest B. Schoedsack, 1933), which also has the benefit of being accompanied by one of the first symphonic scores, not something people were used to in 1933. And even though the silent era may be over, Charlie Chaplin still specialized in making the best in silent comedy, and his Modern Times (1936) represents the best in what the medium could do. The thirties also saw the rise of Disney, who released their first full length animated feature, Snow White and the Seven Dwarfs (David Hand, 1937) to widespread critical and popular acclaim. A look at that film is a splendid introduction to what would be come a multi-billion dollar empire and the birth of a new branch of the industry. "There's no place like home." 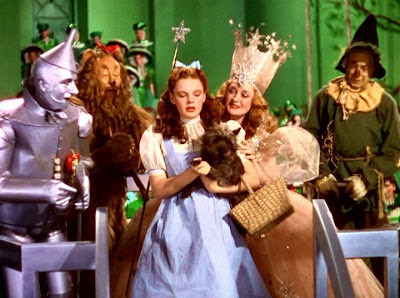 A scene from THE WIZARD OF OZ (Fleming, 1939). While most will have probably seen it already, it's hard to beat the glorious Technicolor spectacle that is The Wizard of Oz (Victor Fleming, 1939). While Gone with the Wind is often rated higher, no movie better represents grand Hollywood myth making like The Wizard of Oz. It's the perfect end to the more carefree movie making of the 1930s before reality, and World War II, sat in. 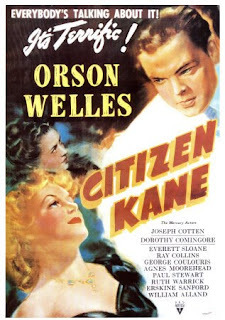 No film class would be complete, of course, without Orson Welles' revered Citizen Kane (1941). The film is often considered the greatest film of all time, and indeed its contribution to film language cannot be overstated. From its deep focus shots to its haunting portrayal of corruptive power, Welles' masterpiece remains a towering and influential cinematic landmark. The 1940s was the time when film noir became popular, a change from the lighter entertainments of the 1930s. To represent the genre, Double Indemnity (Billy Wilder, 1944) can't be missed. As color began become more and more common in film, an introduction to the Archers seems in order - Michael Powell and Emeric Pressburger, who turned color and lighting into an art form all its own. The Red Shoes (1948) may have been their crowning achievement, but no film demonstrates the power of lighting and understated sexual tension as Black Narcissus (1947). "I'm ready for my close up." Gloria Swanson as Norma Desmond in SUNSET BOULEVARD (Wilder, 1950). Hopefully this should bring us to the end of the first half of the semester, at which point a good summation of what has been covered up until this point would be Billy Wilder's Sunset Boulevard (1950), which serves as a dark satire of Hollywood as well as an elegy for the silent era. We've covered more than 50 years of cinema so far, and we've got about that much more to go. To sum up, here are the list of films I would show so far in the period from 1895 - 1950. Bear in mind many of the earlier films are only minutes long. Keep an eye out for the rest of the semester, coming soon. I took a "Film Genres" class second semester last year. We started with film noir. The classics we watched were "The Maltese Falcon" and "Double Indemnity," and the modern neo noir we watched was "Blood Simple." For the silent film unit, we mostly sticked to Keaton and Chaplin, although we did watch "A Trip to the Moon." We finished that unit up with Chaplin's "The Gold Rush," which I really loved. We finished the year by watching "Citizen Kane" and "Casablanca" back-to-back, and then having a class debate about which is the greater film. This is most likely not a shocker, but most average high school juniors and seniors prefer "Casablanca" by a long shot. CASABLANCA is a more accessible film, so I'm not surprised. It's certainly a great film, pretty much perfectly executed, but it's no competition for CITIZEN KANE. On "The Girl Who Played With Fire"
Review: "The Milk of Sorrow"
DVD Spotlight: "For My Wife" & "Water Wars"